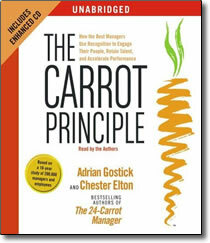 The Carrot Principle reveals the groundbreaking results of one of the most in-depth management studies ever undertaken, showing definitively that the most successful managers provide their employees with frequent and effective recognition. This exceptional program, sure to become a modern-day classic, presents the simple steps to becoming a Carrot Principle manager and to building a recognition culture in your organization. You’ll learn how the best managers use recognition to engage their people, retain talent, and accelerate performance. Following these simple steps will make you a high performance leader and take your team to a new level of achievement.